If we’re looking at repetitive consistent outcomes of people doing the right thing at the right time, then there probably is a place for that traditional role. Everyone wants people to actually make a difference to the world and be creative and do things that haven’t been done before in ways that haven’t been done before, then we can’t tell them how to do that because we don’t know. It’s a change to meet the needs of today and the rate of change that we’re experiencing now in all areas of our life, you can’t have a didactic way this is how you do it. 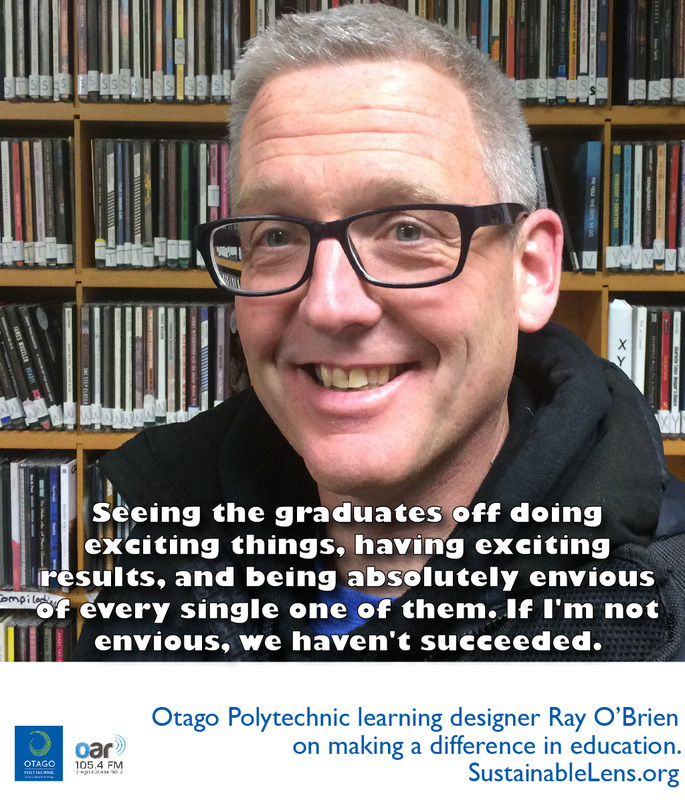 SL: Tonight we’re joined by Ray O’Brien, and he’s a learning designer at Otago Polytechnic. Welcome to the show, Ray. How are you doing? SL: Obviously, that accent isn’t from around here, although this studio is full of accents that aren’t from around here. Where are you from there, Ray? Ray: Originally from the West Coast of Scotland. SL: What part of West Coast. Ray: The original Helensburgh. Still a little bit uncanny here in Dunedin seeing the transplanted Helensburgh in the buses. SL: What was it like growing up in Helensburgh on the West Coast? Ray: Other than windy and wet. Ray: It was actually a great place to live. Some was referring to pure adventurers there. That’s certainly something that moulded the early part of my life getting up into the mountains and it’s right on the boundary line between the Lowlands and the Highlands, so to escape up into the hills in Helensburgh was great. SL: Fantastic. You went to school there. What were your favourite subjects at school? Ray: Probably physics and if I look back a dream if there was outdoor ed, but there wasn’t, but I’ll count it as a subject I did anyway I missed enough days of school to go up into the mountains that I can count it as a subject. SL: Do you obviously decided to go to college at some point, so what did you do there? Ray: It wasn’t physics. It wasn’t physics. It definitely wasn’t physics, no. I actually cards on the table confession time, I went to university to become an accountant and then during my recess at the end of the first term, I realised that that probably wasn’t the life for me and I switched over to human resource management. SL: All right. Where did you study? Where were you studying? Ray: The University of Sterling. Again, the choice of university was more about getting into the mountains than it was about any academic concerns. SL: Exactly. Sterling is quite a small town and so you had … How big is that? How big is the University of Sterling? Ray: Oh, I’m not sure the figures now. It’s grown a lot since I was there but when I shifted from high school, a very large school, to university, I think there’s only 500 more undergrads there than there was number of students in my high school. SL: Of course, Sterling is a very famous place and it’s a beautiful little castle and it’s kind of like a miniature Edinburgh, really. You studied human resource management and you graduated with that. Ray: Yeah. With that and then started working in the outdoors but trying to combine the two, looking at development training. Did a little bit of work with the oil industry doing team building for people that worked out on the rigs and working for companies like Outward Bound and taking a development angle on adventure and the outdoors. SL: Fantastic. That was you’re based out of Aberdeen, was it? Ray: That was where the oil industry stuff was, yeah. SL: Okay, cool. You did that and decided what’s next on your adventure. What happened next? You’re out in the oil industry, decided what to do next. Ray: Yeah. I was delivering development training for the oil industry guys. I was never managed to get on a rig myself. I’m not sure I would have been able to handle that. SL: Going out on the helicopters at the North Sea. Ray: Yeah. The dunk tank test would have got me, I think. Then after university, like I said, I moved north and I started working at Adventure Training Centre run by the Sports Council. It was much more performance coaching rather than developmental, and that led on to a job working for the military for eight years developing leaders and guides for their adventure training activities. SL: How do you train for leadership? How do you do that? People say you’re a natural born leader or not. How do you train people to lead? What are the key requirements? SL: Take them up a mountain and lead from there. If they lead their way down, then you’re a leader. Ray: It’s an interesting question and I think can you teach leadership or can you develop leadership. I think it all comes down to what opportunities you can offer people and how you can help them to relate it to their everyday context. With the military, my job was to work mainly with senior NCOs and officers and find adventure situations that let them practise the skills of their organisational skills, their communication skills, real situations that didn’t have the consequences of them being in theatre, and yeah, and much, much bigger risks. SL: What is leadership? What is that as a concept? Ray: How long is this talk? SL: If you give a brief description of what leadership looks like. SL: Is it telling somebody what to do? Ray: No. I think it has been viewed as that in a traditional sense of leadership. Actually, when it comes down to it, it’s the people who earn the respect and that respect is usually earned through some form of service to the people that you are leading. I think that’s morphing now and that leadership is not as commonly seen as a one person leading and more about the collective leadership and people taking leadership roles within a more equal group. SL: You’re going from kind of a hierarchical system to kind of a team, more team egalitarian system. Have there been major shifts in society that have driven that or is that just yeah, this seems to be more effective role or is it both those things? Ray: I think it’s situational. I think it depends what we are valuing or wanting in society. If we’re looking at repetitive consistent outcomes of people doing the right thing at the right time, then there probably is a place for that traditional role. Everyone wants people to actually make a difference to the world and be creative and do things that haven’t been done before in ways that haven’t been done before, then we can’t tell them how to do that because we don’t know. It’s a change to meet the needs of today and the rate of change that we’re experiencing now in all areas of our life, you can’t have a didactic way this is how you do it. SL: Was this exclusively with the British Armed Force or did you work with other militaries, as well? Ray: It was a Joint Service Mountain Training Centre, so yeah, it was all the British ones. SL: Okay. What happened after that? That was obviously a major adventure. Ray: It was a learning, it was a great adventure and it had me on expeditions all around the world for five or six months a year, but then I had a daughter and I didn’t want to be away from home for five or six months a year and it was time for a change, and that change took the form of a year’s leave of absence where we all came across to live in New Zealand for a short time to try it out, and here we are 13 years later. SL: Ah. You came to New Zealand and where did you land, first of all, or where did you arrive? Ray: We tested it out in the classic Brits in the camper van around the ski areas for a winter. Then went back and organised our work and packed up our house and moved to Hawea, just outside Wanaka. SL: You just fell in love with the place yeah, this is where we want to be, this is where we want to bring our daughter up. Yeah. Fantastic. Are you still based in Hawea? Ray: No. Moved down to Dunedin two and a half, three years ago. SL: All right, wow. Fantastic. Now, you’re teaching, you’re a learning designer. Describe for me what a learning designer is. Ray: I work in a team of amazing people who do a combination of facility learning design where lecture staff and teaching staff take the courses they’re already teaching or take new programmes and look at different ways to bundle up, reshape it, modernise it, change the way that it’s taught, and align it with more strategic frameworks, so it really meets the need of today’s learners. The other half of the team work on how can we build assets, such as online learning, all of the different resources are required to support that, and also how can we help the staff. Because a lot of the changes are quite significant. How can we make sure that they’re fully supported to be successful? SL: How does this modern teaching environment, how is it different from the traditional lecture setting, talk to class, give them the lecture, students taking the notes, and then asking questions in tutorials? How is the modern classroom different now for people who haven’t been in there for a while? Ray: Yeah. I think the main thing, the main myth to bust is that we’re going from a modern classroom to, from a traditional classroom to a modern classroom, and I don’t think that new model exists. I think it is much more varied than, perhaps, a traditional here’s a lecture hall. Typically, when you look at some of the things that polytech does across trades and different work contexts, what we really need to find is a blend in that learning environment. That blend can be a workplace, a real workplace or a simulated it. It could be classroom-taught sessions. It could be online resources and it’s finding the optimum blend of those things for that group of students and that topic to make sure that they are the people that are getting employed at the end of it are the first choice of people to be employed at the end of it. SL: How do you assess that? How do you decide, okay, for this group of students, this mix for them and for this other group of students, this is the mix for those students and those two learning environments might be quite different. How would you assess which students, what models to which students? Ray: Yeah. The core of our design process is human-centered design, so we spend a lot of time looking at who are the learners. That’s not necessarily who the learners sat in the classroom today are. It may be looking at what new groups of learners might be coming in, how we could change it to allow access to other groups of learners. I guess to give you an example of that, some of the new business courses that we’ve developed, there are campus-based courses, predominantly those groups are school leaders. We also have predominantly online courses, which most of the people on those courses are actually in work, perhaps even in management positions and the two different blends their needs differently and that’s taken into account right at the start, so what do these people need? SL: Can you teach the same course to different groups of students? Like for instance, ones who prefer the more traditional method and another group, for instance, work or maybe have families and stuff and can’t make the same time commitments. Is it possible to create courses like that or? Ray: Yeah. With those specific examples of business courses, there are different delivery modes for the same course. Ray: Yeah. In terms of the learning outcomes that they match up to and it’s the same qualification. Yeah. The bar is set at the same height. Yeah. In terms of what they gain from themselves, I think if we have rich enough experience in there, then it’s not a cookie cutter experience and people can make their own meaning from what they experience, so yes, the bar is at the same height but how they interpret that and make meaning from it in their own life’s context, that will be different. SL: How do you sit down with, thinking about students’ perspective, but how from the teachers’ perspective that the lecturer or the instructor, how do you sit down with them and maybe guide them through a process that might be quite unfamiliar to them or challenging the way they’ve done things for many years and how do you guide them through this process? Ray: You’re absolutely right. It can be very challenging. Yeah. Particularly given we have some very good outcomes and data to say that we are getting it right, so here’s some learning design coming in telling me to change it all. There is a risk. Yeah. There is a risk. I think if we look at innovations anywhere, the risk I think is more with not looking at the future and changing more so than staying with the old model of knocking a blockbuster, whichever you want to compare it to. I think most people recognise there’s a need to change and it’s not just for the set of students that are in the class with you right now. It’s looking forward, and that’s important leverage to make people happy to take the steps and designing something different. SL: Is there an actual cultural change in the kind of students that are coming through and our expectations compared to 10, 20 years ago? Is that an actual thing or is that something we kinda made up or is it a mixture of oh, we just got the new technology. Let’s just do it in a different way. Ray: I guess my understanding of that in terms of the New Zealand context is, to some extent, secondhand, because I wasn’t here to witness that. I can certainly see people are being more demanding in terms of students have been more demanding in terms of a return on investment. They’re coming out of education with some hefty debts and I think it’s ethically right that as institutions, we should be designing to make sure that they get value for their money. Yeah. They are demanding that education makes a big difference for them and their lives and they’re quite right to do that, so that’s a slightly different culture from it’s all paid for and just going to study to access cheap beer and have a party. SL: If you are designing a new course, how do you actually practically go about that? If you come to a course, say, I’ve got this course we’ve been teaching it for ages. How do you come in and go, okay, what do we need to do here? What’s your approach? Ray: I think the first part is evaluating how the courses go already. It needs to be strengths-based. It’d be very easy to pick sticks out of any particular way we have designed in a course, but you have to look at the strength and what is going right and make sure that those things are not lost in the design. You also have to look at the student and you also have to triangulate those things with what does industry want. Where are these students going after their qualification? To be honest, that’s the real tricky one just now because how sure are we about the industry they’re going into? As Sam referred to earlier, there’s as a huge amount of unknown in the future of the jobs market, so trying to triangulate that with what we’re getting right just now and who the learner is and what they need. That’s a challenge. From there, we’re looking at what do we want the graduate to work to look like, what do they have to be able to do, what capabilities do they need, and from there, it’s almost like a cascade down that’s getting down to finer and finer learning outcomes and what experiences can we put together to allow them to show those things in an authentic way. SL: One of the, of course, the key outcomes for any Otago Polytechnic student coming out is that they’re a sustainable practitioner. What’s your role in helping to integrate those high-level goals and outcomes for the students like good citizens and good contributory members to society? How do you integrate those into, for instance, being a car mechanic. How do you integrate this very high-level things into something that’s very practical, cookery course for a chef? Ray: Yes. There’s two parts to it. One is integrating into the course and then the other part is integrating it with the graduate capabilities framework. I’ll deal with the course first. It may well appear at that highest level at the what we call the graduate profile outcome, the big picture stuff, but it might actually, it can appear in two different ways. Some of it can be quite implicit in the way that the course is taught. The fact that things are role modelled, it could be the car mechanic because you see the workshop is organised and the materials are being disposed of appropriately, and that in every decision that’s made, there is a sustainability aspect to the decision about how things are done. It’s implicit in the environment in which you’re being taught. SL: Other than, because we talk about how you role model behaviour, then you make it explicit, so the implicit and the explicit instructions about, okay, think about how to do this. With those high-level goals being, for instance, a good team or whatever, a lot of those skills learned outside the classroom. How would you integrate or how would you encourage students to learn those skills outside the direct learning environment? Ray: I think the key there is to try and break down that barrier where we have the learning environment and outside of the learning environment, that’s the first thing we need to break down. Really, it’s more of a continuum where you get slightly distant from the institution or you get closer within the walls of it, but the learning, the geography of it doesn’t really impact whether you’re learning or not. Again, it’s one of those myths to bust. If you’re not in the class being spoken to, you’re not learning. That’s not the case at all. Some of your base learning will actually happen as your voluntary job at the weekend, is it the club that you do stuff with. Is it within your family? It’s drawing all that in and including that big picture that rich learning from your whole context, not just when you happen to be on a seat in front of a lecture. SL: When you’re doing learning design, and when you talk about geography has prompted me to think about this, is that the way the polytechnic now is set up is stepped away from the lecture theatre as being the centre to being having a lot of very diverse learning spaces. Does part of designing a learning environment look at physicality of how you’re learning? Is that part of what you look at? Ray: It certainly impinges on our design decisions. There’s no point when I was designing a great learning exercise or module. We don’t have the facilities to deliver that. As we publicised last week, we’ve got some major reinvestment going on at the polytech and I think the new learning spaces and changes to pedagogy and how people are learning and the options available to us, those two things ride hand in hand and yes, one has an implication for the other. I heard a great little tale of from the University of Technology in Sydney where they have just gone through I guess 1.2 billion of investment on their campus and the vice chancellor, who is accountable for the spend, was trying to prove the worth and going around and showing the president of the institution exactly what had been done. He managed to find a group of students working in a learning pod with a screen around the table exactly as it has been done working independently on their project and she went up, introduced, and said, “I’d like to hear what you do and what do you think of the new spaces.” All the students smiled and looked around and said, “Great. We really wish our university had stuff like this.” While it justified the pedagogy and the environmental link, it didn’t necessarily justify the spending. The two things happen hand in hand. From that same example, she had one space, this is Shirley Alexander from UTS, and she had one space where it was very open plan, lots of pods, easy to move the furniture around. Got feedback from one member of teaching staff who said this is great. I’ve got so many different options as to how to teach at this course, teach the same course at another institution that don’t have those options. I can provide a richer learning experience for my students here because of the space. The same room, she got a complaint from another member of staff who said she had designed the worst lecture hall he’d ever worked in and she saw that as a major measure of success. SL: You’ve taught in a whole lot of environments and a whole lot of places, but mostly in outdoor work. On your LinkedIn profile, it says you’re passionate about education and the environment. I want to just loop around to educating about the environment. How are we going? Ray: How are we going? I think we’re still patchy. Yeah. I think education about environment. It’s an interesting concept just about the environment because it’s actually, for me, it’s about building a relationship with the environment, not having a knowledge about the environment. Yeah. Because there’s a lot of people who don’t necessarily understand any of the science or any of the technology that and the, perhaps, some of the global issues that are happening who have a really strong bond and value of the land and of the environment. Education about the environment, I’m not sure that it is an about question and I think building that relationship and education in the environment is where we should be looking more to be able to make change. SL: How do I teach for with the environment if I’m teaching accounting? I can understand that it’s an easy step if you’re floating down a river to be talking about the river. Yeah? It’s a harder ask if I’m teaching accounting. Ray: I think you have more opportunity to scale. If I was to put my fledgling accounting student head on, then I would be on a river, I could share, I could make everybody see the value of keeping that clean and swimmable and looking at other sources of power so that we didn’t lose all the rivers to hydro. That is an easy sell. I agree. If I go into the accounting classroom, then I’ve got people who are potentially making decisions not just about how they behave but how whole organisations behave and the scalability of the decisions they’re making potentially, much huger, so helping them look at integrating the triple bottom layer and examples of that and you run a really powerful position and I believe that most students now are looking for something that’s more purposeful. I don’t think we have to wait until we had a divorce or a midlife crisis before we start looking for purpose in life. I think people are leaving school wanting to explore what is my purpose now. SL: What do you do about those accountants whose purpose in life is to make a lot of money and drive a big car? Ray: They will always be there. Yeah. There are always going to be challenges that are hard. Maybe that’s not why I’m not an accounting lecturer. SL: Yes, but you’re helping people design accounting courses. Ray: Yes, I am. I think people have to make their, it’s based on values and you can expose people to experiences and opportunities and they can still use their own values to make good decisions. Are you going to be able to change everybody’s mind? No, you’re not. Will they have experiences and opportunities that, perhaps, further down the line will accumulate and other life experiences beyond their qualification? Then perhaps you set the foundations for something later. SL: Do you have a bottom line or a triple bottom line. Do you have a bottom line of how much people can must, perhaps, accept things? Ray: I think when it comes to values, we are not here as an educational institution to assess people’s values. I think people can be asked to evaluate them themselves and reflect and think on it and that’s where I would say we have a really important role to get people looking at themselves. SL: If we ask you that lots of times and, hopefully, they’ll get the hint. A couple of years ago you went to Nepal. Ray: Oh. We had some friends who were also had also gone there and they were all teachers or educators of some form, and they got involved with an organisation called REED Rural Environmental Education Development. They were based in Katmandu but operating predominantly in the Lower Khumbu Valley and delivering teacher training programmes, which is an incredible experience. We had 10 days. Each training was 10 days long and teachers came from two or three hours walk, different villages, descended on the village that we were in, and we rotated round, my wife and I working in the English classroom. I wasn’t allowed to work in the English classroom because they didn’t want lots of Nepalis with dodgy Scottish accents so I was helping in the math class getting back to my physics roots of skill. Yeah. It was a fantastic experience and certainly great to have our kids there, as well, and see them get involved with the locals and school there. A completely different educational outlook of first thing every day at school is brain gym. We’re all out in the field doing our physical shakes and moves and then into the classroom and as an educator, it was quite challenging in terms of we’ll look at changing pedagogy to be more active learning and more participation, but the bottom line is that you’re a teacher in a crammed classroom with a mud floor and there’d be 70 students of diverse ability and age in front of you, some of whom will not have had breakfast, some of whom have already done two or three hours of agriculture work before they come to school, and someone from New Zealand is coming across telling the teachers to form little groups and get them working together. It’s a very different dynamic and I think that the important thing that I learned there was about just how important humility is when you’re in those sorts of positions because they know far more about what they’re doing than anybody visiting can. You can offer them some extra options. You can be there to answer some questions but, perhaps, probably the most important rule there was to validate what excellent jobs that we’re doing with what they had, yeah. SL: How would you describe the difference you made? Ray: The difference I made there. The key thing on the maths sessions that I did was actually the link between maths problems and their real life was not implicit in what they’re doing, so it was all very abstract examples of maths, so algebra. What examples do you teach? How do you integrate it. It was just numbers and letters on a board and making that step toward well actually, this is the price of chickens and this is the price of a kilo of rice. Yeah. Just making that link between real life and something useful and something that’s seen as quite academic and abstract. Within the classroom, that was a difference. In terms of making a difference in the broader scale, I still hold some really close links with the teaching staff and the mentors I was working with there and, like I say, validating what they do by the fact that you see the value in it from your New Zealand western perspective can give them some confidence to do a bloody hard job yeah, so yeah. SL: You’ve got a value or a mission something but to make a difference. SL: I’m not sure how long you’ve been using that particular phrase but you probably called it something else before. Where’d that come from? Ray: I think it’s always been there. I think probably a big brother thing in there. Yeah. I’m the oldest of three so I think there is an eldest child element to that. It’s become easier to articulate. I lost a very good friend about three years ago in a helicopter crash and he’s certainly someone who lived his life. His mission was to make a difference. He was volunteering In Rwanda, and was kidnapped and had to be rescued by the SAS. Came back, joined the Royal Marines because he thought that was a way that he could personally make a difference, become a Marines helicopter pilot. Ran lots of missions there and then realised that that wasn’t how he wanted to make his difference and that he didn’t feel that were, he was involved in were making a positive difference. Left and moved to Wanaka and did some work in Papua New Guinea also setting up flying ambulances in Papua New Guinea, as well, so yeah. In terms of something that flipped the switch and made it clearer to articulate this is actually what I’m here to do, that’s probably the single event that clarified it. SL: You haven’t used the term sustainability but it’s the name of the show, so I will. Do you have a go-to definition of sustainability? Ray: Putting back more than you take out. SL: Is that how you tell if it is a positive difference? Ray: No because I think sometimes you can – I think it’s more complex than that. Yeah. Certainly, I think if it reflected my experience in Nepal, putting back too much could actually disempower, yeah, and reduces sustainability of it. Yeah. I guess it depends how big a picture you look at for putting back. SL: What is the biggest success you’ve had in the last couple of years? Ray: I think for me it’s got to be my kids and seeing them developing values about…I’m going to use the making a difference phrase again, yeah, rolls off the tongue but I can see that in them, that the caring and the sharing and the things that they value and what they do in their life and I think we’ve all got quite a big responsibility to keep passing those values on, whether it’s through families or friends or relationships. It’s a way to multiply a difference it would make. SL: We are writing book of these talks. We’re calling it Tomorrow’s Heroes. How would you describe your superpower? SL: Yeah. That you have, not that you wish for. Ray: Okay. My superpower, I think probably, the thing I bring to the table is more about making connections and joining things together. Whether that’s people or whether that’s events, it’s the connections. SL: Do you consider yourself to be an activist? Ray: Activist. There’s so many different meanings of that, isn’t there? SL: You can define it like however you like. Ray: I don’t see myself out on the street with a placard chanting, so if that’s an activist, I don’t see myself as that, but do I see myself as actively trying to influence people to do more positive things? Then yes, I do. SL: Lots of people answer that question. Oh, I’m not a Greenpeace activist. Then we talked to the head of policy from Greenpeace and he said, I’m not a Greenpeace activist. What motivates you, what gets you out of bed in the morning? Ray: Other than my really annoying alarm clock, it’s, it is about the kids. Yeah. It is about the kids and seeing them grow and making that daily impact on how big an impact they can have. SL: Taking them to every sporting event known to mankind. Ray: Yeah. Maybe I should look at my carbon footprint about how much sporting driving I do. SL: What’s the biggest challenge you’re looking forward to in the next couple of years? Ray: Right now, I think the biggest work challenge is going to be getting the BMaD or wherever you end up calling it off the ground, and seeing some students graduate from that. SL: What’s going to be the hardest bit of that, do you think? Ray: I think probably the next six months of it. Yeah. Next six months the amount of work to get through and I think once we get through the formalities, there’s so much foundation and solidness and underneath the principles we’re working to there, I think once we’re up and running, that will go well. SL: What will success look like for that? What should we be aiming for? Ray: Stories. Lots of stories. Yeah. I should be looking on the Facebook account and seeing the graduates off doing exciting things, having exciting results, and being absolutely envious of every single one of them. If I’m not envious, we haven’t succeeded. SL: You could do them, those things, too. Ray: Yeah. Because you’ve done lots of those things. We could. There’s only one of me and there will be lots of them. SL: If you can wave a magic wand and have a miracle occur, what would you have happen? Ray: A magic wand. I’m guessing that I don’t believe in magic isn’t an answer to this question. Ray: Yeah. Okay. If I could wave a magic wand, I’m trying not to make a Miss World answer out of this one. I think I’d probably pass the magic wand on to my kinds for them to decide. SL: Okay. What’s the smallest thing that could make the biggest possible difference? Ray: Yeah. I think a smile is cheap and easy, yeah, and it goes a long, long way. SL: Lastly for me, do you have any advice for our listeners. I think you might have given one but here’s another one. Free hit. Ray: Advice for listeners. I think yes, the small things do count. Yeah. The smalls do make a difference but as long as you make sure that the person that you small at is sending more smalls, we need to work out ways to keep multiplying what we do because we can’t really the scale of issues we’re dealing with and the rate of change we’re dealing with, there’s no lonesome warrior and no lone-ranger that’s going to be able to do this. It’s everybody and we got to make sure we’re persuading each other and working together to make a difference.